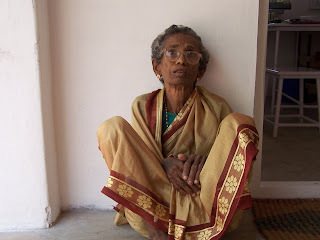 Maddamma is all of 65 years. 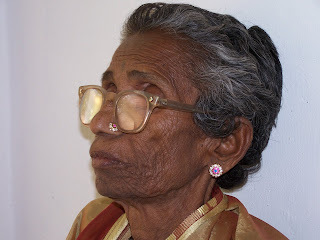 She is virtually blind thanks to poorly done cataract surgeries done in a camp many years ago - the thick spectacles being testimony of the same. She has been virtually abandoned by her sons, two of them, who have migrated to towns and cities for better jobs. The lack of rains coupled with poor landholdings has ensured that the family can not survive on agriculture. So what happens to an old woman who is "unproductive" as she is weak, infirm and can not see - GERIATRICIDE. She was brought to us in a moribund condition - fever for three months, malnourished and we thought so thats it. Modern antibiotics and good nursing care did the trick. She is now OK. But what about her future. Who will support her, feed her?? Was it ethical to treat and prolong life so that she will continue suffering? I do not know - I have no answers only a whole lot of questions. IS THERE A LIFE FOR THEM???? Two photos and they say it all - or do they! In this age of globalisation, 9% GDP and starting salaries of a crore, does it really make a difference to these two girls???? I wonder. Both of them were unfortunate to have been born girls and to make matters worse to a family that is struggling to survive. 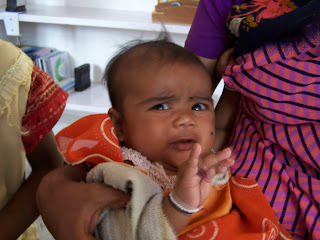 The baby came to us absoloutely dehydrated - medical reason is simple enough - Summer Diarrohea - But the Social Cause - being a girl and that too the 2nd in the family, neither the husband nor the grandmother allowed the mother to bring the baby to a doctor. Why - She is after all a girl. Needless to say my blood boiled - the baby was cured but what about the social evil. 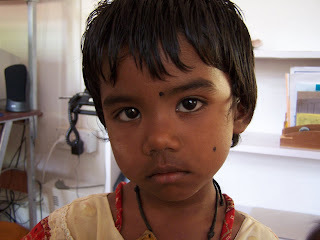 The elder daughter suffers from malnutrition - reason - poverty on one hand and girl child on the other. What can we do to eradicte this evil. It is pernicious and sucking our society dry. I really wish that social equity was well ditributed so that all could benefit from the so called fruits of a booming economy. So the Financial Year draws to a close - these dates are just tick marks in a calendar - they mean nothing but some symbols of trying to organis nature to suit mans needs. No I am not being chauvinistic whenI use the word man - rather it represents the whole of human kind. Well the merry month of March marched along - 1697 patients, 83 eye patients seen and 09 cataracts operated. Not bad for two of us slogging it out here. It becomes increasingly difficult as the days go by try and and achieve a modicum of control. We are constantly being overwhelmed by numbers seeking help and a friendly voice. Many a time I doubt the "friendly" voice as the day goes along I find that I become progressively more irritable and at times do snap at the patients - Not good clinical practice - you will all agree! But whenone is overwhelmed the mind and to a greater extent the physical body can only take so much. What does one do? I really do not have any answers. All of us here at the health centre are eagerly looking forward to a break in summer when we close for a month - a much needed one to recharge ones batteries and come back with a fresh outlook to life and to try and serve the needs of the needy.